Green Cycler Kitchen Composter Review: Is It Worth The Money? →Green Cycler Kitchen Composter Review: Is It Worth The Money To Speed Up The Your Composting? The Green Cycler allows you to add a new element to your recycling responsibilities. Many compost bins are designed for large amounts of organic waste. If you live in an apartment or don’t have a lot of yard waste, you might not benefit from a large-capacity composter. What if you still want to create your own nutrient-rich fertilizer for plants and reduce the waste that goes into the landfill? The Green Cycler is an ideal solution for small spaces and minimal waste. It’s an appliance that shreds and holds kitchen scraps to create the ideal pre-compost. You can’t actually decompose your kitchen scraps in this appliance, but you can shred them into smaller pieces so that they decompose faster when you add them to your compost bin. The shredding capabilities allow you to add your kitchen scraps to smaller composters, such as vermicomposters, to get usable compost material in record time. In addition, it contains the odor that can develop in an indoor compost collector when it’s filled with moist kitchen scraps. This Kitchen Composter turns kitchen waste into quickly compostable scraps. Normally, items like banana and avocado peels can take several months to break down in a composter. In fact, some experts recommend not putting in these tough, fibrous materials because they may not break down completely. The composter begins the breakdown process by shredding these materials into small pieces. This allows them to decompose in a fraction of the time whether you’re using them in a ﻿traditional composting bin or a ﻿worm composter. This appliance has suction cups to stabilize it on the kitchen counter as you use it. 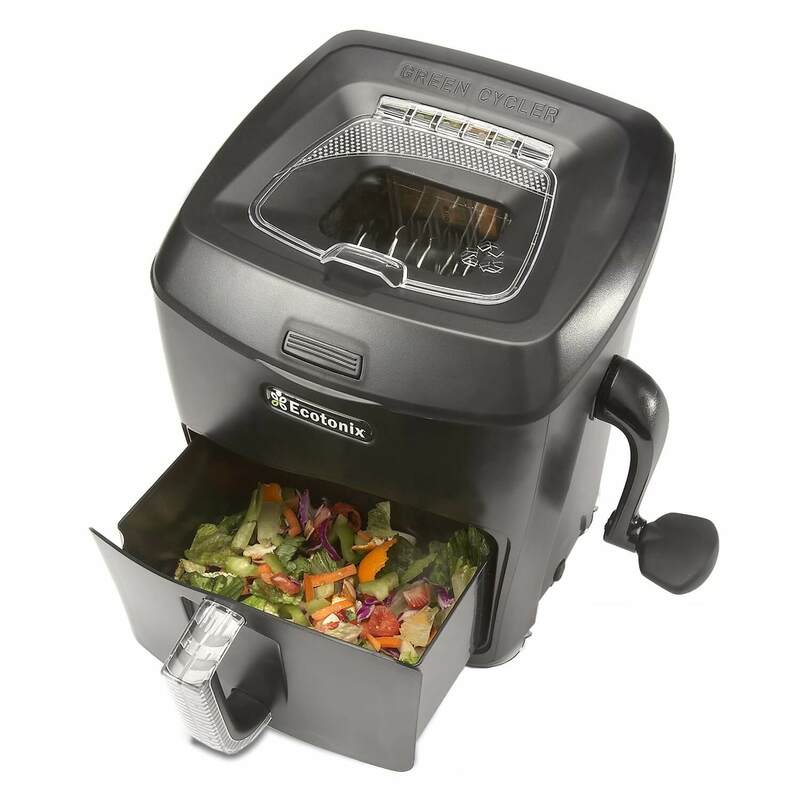 You can feed food scraps through the top lid, where they fall into the shredding compartment. As you manually turn the crank on the side of the machine, hardened steel shredder blades rotate to grind through the materials. The scraps then fall into a drawer that can be easily removed to bring the material to your compost bin. All of the components that touch food can be removed and placed in the dishwasher for cleanup. Optional compostable liners can be used in the drawer area to prevent mess. Filters made from volcanic rock are included to reduce odors, keep away fruit flies and create the right moisture balance. These filters are 1500 times more absorbent than activated charcoal. You can recharge these filters in the sun for eight hours. The durable blades aren’t sharp, so they never have to be sharpened. They’re powerful, however. They chew through hard, tough food scraps. This product comes with recommendations for composting and provides instructions for cutting up different types of organic materials before inserting them into the shredder. Supercharge your composting – Even the toughest kitchen scraps become compostable when you shred them. Heavy-duty machine can shred mango pits, avocado pits, banana peels and more. ​Contains odor – Specialized ventilation system optimizes air flow to neutralize odor-causing bacteria. ZeoPack filters aid in odor control. Easy to clean – Shredder cartridge removes as one piece, and all parts are dishwasher safe. Stays in place – Suction cups keep the appliance immobile during cranking for added safety and ease of use. Not a compost bin – You’ll need a separate composter to turn the kitchen scraps into usable compost. 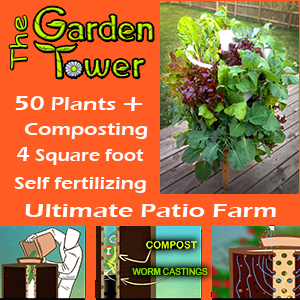 However, the scraps created with this appliance can be used in smaller composters or mixed directly with garden soil. Difficult assembly – Although not much assembly is required, one user said that the knob was hard to place onto the crank arm. Takes up space – The 13” x 14” footprint takes up more space in your kitchen than most compost crocks. However, the sleek design is attractive if you want to keep the bin on your counter. The bin also holds plenty of material. Most users only have to empty it once a week. Is The Green Cycler Right For Me? If you’re looking for an accessory to make ﻿﻿composting﻿﻿ easier and faster, this is an ideal product. As it chops up food, it weakens the fibers, allowing it to decompose more quickly. It also collects kitchen waste in a convenient, odor-free container so that you don’t have to empty it as often as other compost crocks. This appliance makes it easier to use tougher materials, like citrus peels and fruit pits, in your tumbler. You can shred just about any plant-based food source in the machine. If you don’t have a compost bin at all, you can’t allow your food to completely decompose in the chamber. However, you can add the chopped up bits directly into your garden or brew them into tea to use for indoor plants. You can also dig a shallow trench in your yard, empty the scraps into the trench, and cover it up with soil. They will decompose quickly and add nutrients to your soil. Although this product is by no means necessary for composting, it can save you time and space. That means that it might make you keep up your composting routine more consistently. It’s relatively affordable, and you can make up the added cost by purchasing a smaller bin. This would be a perfect addition to a tumbling compost bin, because the food would break down more rapidly, leaving you with fewer intact food scraps when it comes time to use your compost. Check Out The Green Cycler NOW!